Today we are lucky enough to have Jenna with us Guest Blogging - she is an amazing person who we are lucky enough to know personally. Please take a moment to read her post and feel free to leave comments in response on our Facebook page. I could have never imagined the delicate and tragic world I was going to experience during my second pregnancy and especially on the days of September 30th and October 1, 2009. After a very long, complicated pregnancy of carrying identical twin boys, diagnosed with Twin to Twin Transfusion Syndrome, my husband and I were presented with the decision to deliver at only 28 weeks gestation and risk the disadvantages of premature birth or continue on with the possibility of one of my boys going into heart failure, and risk losing one or both. On September 30th we decided to deliver, hope and pray that the last few weeks of planning, prepping, receiving steroids for lung growth, and assembling NICU teams and doctors, would be enough to sustain the life of my sweet baby boys. Colin came first weighing 3lbs 4oz. and went off immediately to be cared for (He was the one in fear of heart failure). Seth was next at 2lbs 4oz and seemed to be doing a little better, but still in need of intensive care. Even with all the commotion, anxious, and scary feelings my husband and I shared, we still found a way to feel so blessed and blissfully happy. Seemingly, it was a beautiful day; we had a room filled with our family, and the boys were receiving great care. Little did we know those feelings wouldn’t last long. Colin started to show reversing signs of his heart failure and was stabilizing right away. He didn’t need surgery and appeared to be doing well on the oxygen. Seth on the other hand, wasn’t doing as well, even though he seemed to be the stronger one in the womb. His complications started quickly and on October 1st, we were faced with the realization that he was just too under developed. His ability to be sustained was rapidly decreasing. The doctors were uncertain of how much time he had left, but informed us that it wouldn’t be long. It was devastating news. The possibility of this happening was explained to us early on, and we had weeks to supposedly “prepare”. There is nothing in this world that can get you ready to handle the realization or the experience of losing your child. It was a bitter sweet moment… How was it possible to feel relieved and elated about the good news of one baby, only to be confronted with the reality of losing the other? My world was shattered. Through all of the emotions and feelings, somehow I was able to find a moment of peace and thankfulness… Up to this point, I had only just been able to touch the babies and still had not held either one. They were both boxed up in their incubators with tubes and wires everywhere. It was heartbreaking to see. The only thing that I could think about after receiving the news of Seth was holding him before he passed away. The nurses dressed him in a precious cap and gown, and bundled him in his blanket and handed him to me. Of course I was already in love with him, but the moment they placed him in my arms, alive and breathing, was more than I could have ever asked for. I was so thankful that the Lord had blessed me the last hour of my son’s life with him in my arms. It was the closure that I needed. Knowing that we got to feel each other and spend precious life moments together was a great feeling. Those are the memories that get me through each day, especially the hard days. I can relax in knowing that he knows how much I love him and that his last memory of this world isn’t that of a sterile box without ever feeling his mother’s touch. I am so thankful that he got to feel me and all the love that I have for him pour out in our last embrace. I got to sing to him, hold, and love him. I got to say goodbye. And even though I knew the outcome and my heart was breaking, it was the most calming and peaceful moment I could have ever experienced. It was three years ago that my son passed away. I definitely wouldn’t say my wounds have healed (or probably ever will.) and honestly, I’m still learning how to cope and grieve. But through those memories and the last moment that we shared, I can say that I am healing. I am happy to hold him with me and finally be at a place that feels good to remember and talk about him. I can say that even though painful, I am pleased to share this experience with you. 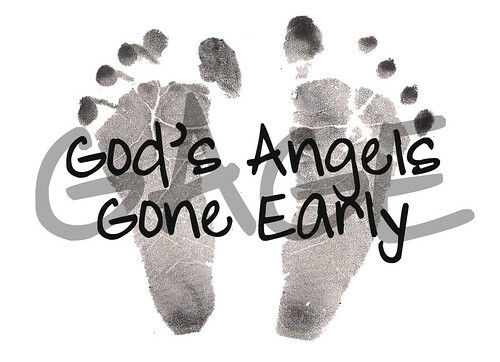 In sweet loving memory of my son.